This lecture covers the fifteenth and sixteenth centuries in Northern Europe in areas including France, the Netherlands (Dutch art), Germany, and Flanders (Flemish art). It includes pictorial works in a range of media including paintings, prints, and textiles. Some sculpture was made in the North at this time, but is not included here because sculpture in the North is typically not considered as formally transformational as it was in the contemporaneous Italian Renaissance in the South. The Northern Renaissance style might be described as the very singular result of a blending of Late Gothic art, contemporary ideas about observation, and Reformation ideology. The European mind in the North at this time saw their Christian God in every aspect of the world, and so the world was depicted with an exacting naturalism that verged on the spiritual. In order to emphasize the radical revolutions of this period, ask students to try to conjure up the worldview of a person in the Middle Ages. The term “Renaissance” is no joke—Europe really was reborn into a new mindset during this period. Remind students of the absolutism of the Catholic Church (then, simply the Church) for nearly a millennium throughout Europe. You can simply evoke the image of a glorious and mind-boggling Gothic cathedral towering over the medieval city, and consuming much of its manpower and resources. There was only one accepted way to believe, but the Protestant Reformation questioned that absolute power. Emphasize that a medieval person’s experience of visual imagery would likewise have been profoundly different than ours. We are inundated with images, digital and in print, whereas a person in the fifteenth century may have only ever seen visual images on the altarpieces in her church or small woodcuts in her Bible. Explain the term “vernacular” to bring up the fact that the religious texts in which people were compelled to believe were all printed in Latin until the Reformation. That fact, combined with the reality of near-universal illiteracy, meant that knowledge and its dissemination were controlled by a very select few. Sacred writing was mostly experienced through someone else’s explanation, so a believer’s experience of God through scripture was always at second hand. Life under these circumstances must have been fairly oppressive, but the people didn’t receive any information that there could be another way of life. The invention of the printing press by Johannes Gutenberg in 1448 would provide a pivotal step in making knowledge more accessible. 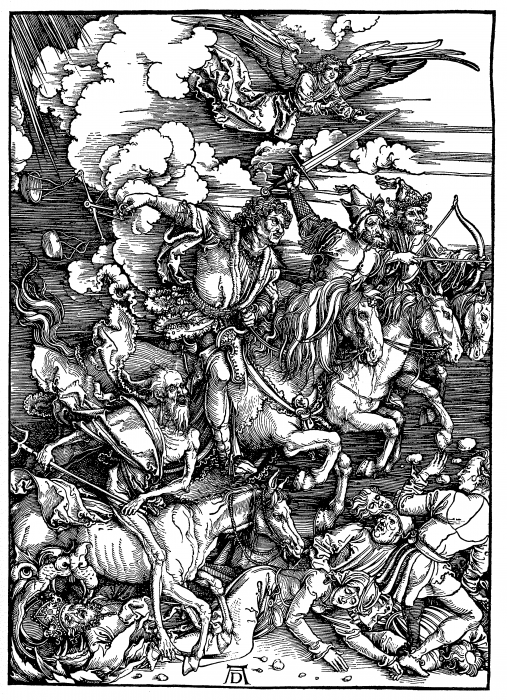 Albrecht Dürer, Four Horsemen of the Apocalypse, 1498, Woodcut. Background readings for students can include your survey textbook and the extensive Smarthistory sections on Flanders, the Reformation, and the Northern Renaissance. For information on the so-called “printing revolution,” see Chapter 16 of the classic study by Marshall McLuhan, or Elizabeth Eisenstein, or this summary. The Metropolitan Museum of Art‘s article on painting in oil is concise and thorough. BBC Radio‘s twenty-minute audio program “Diet of Worms” describes the particulars of the historical moment of the Protestant Reformation. There is also a three-part BBC series from 2007 on the Northern Renaissance that offers sixty-minute artist-specific videos on Jan Van Eyck, Albrecht Dürer (in parts 1, 2, 3, and 4), and Hieronymus Bosch (in parts 1, 2, 3, and 4). “Purgatory” and “Anatomical Man” from Les Très Riches Heures du Duc de Berry, France, 1413–6, Illuminated manuscript. “January” and “February”, pages from the calendar of Les Très Riches Heures du Duc de Berry, France, 1413–6, Illuminated manuscript. Attributed to Robert Campin, Mérode Altarpiece, c. 1430, Oil on oak panel. Jan Van Eyck, Arnolfini Wedding Portrait, 1434, Oil on oak panel. Jan Van Eyck, Man in A Turban, 1433, Oil on panel. Hieronymous Bosch, Last Judgment (open), 1504-8, Oil on panel. Unicorn Tapestry, 1495–1505, Wool, silk, silver and gilt. Martin Schongauer, Temptation of St. Anthony, 1480-90, Engraving. Albrecht Dürer, Four Horsemen of the Apocalypse, 1498, Woodcut, 15 1/2 x 11 1/8”. Albrecht Dürer, Adam and Eve, 1504, Engraving, 9 7/8 x 7 7/8”. Albrecht Dürer, Self-Portrait, 1500, Oil on panel. Albrecht Dürer, Melencolia I, 1504, Engraving. Lucas Cranach the Elder, Martin Luther, 1532, Oil on panel. Hans Holbein, Henry VIII, 1540, Oil on panel. Pieter Bruegel the Elder, The Return of the Hunters, 1565, Oil on panel. Pieter Bruegel the Elder, Peasant Wedding, 1567, Oil on panel. The influence of the International Gothic Style (think elongated, pointed architecture with intricate detail) is manifest in the meticulous, near microscopic paintings of Northern Europe that resemble medieval manuscript illuminations. The Très Riches Heures is a late example of an illuminated Book of Hours (Christian devotional text) that both looks back to medieval artistic traditions and forward to the Renaissance. On the one hand, its medium (hand-painted luxury item), its patron (the über-aristocrat, Duc de Berry) and its format, focusing on cycles of nature and the cosmos (diagrams, hours, and calendar), all scream “medieval.” You might ask students to rehearse the signposts typical features of the Gothic style that they learned in previous lectures. One plate illustrating “Anatomical Man” reveals the odd systems of resemblance between nature, the human body, and the heavens that governed the pseudo-scientific beliefs of the Middle Ages. On the other hand, the manuscript features an intuitive attempt at perspectival space and scenes from everyday life, albeit in a still-feudal society. It can be entertaining to have students point out particular details such as beehives, pets, and items of clothing from the calendar plates. The French dukes of Burgundy controlled an area of present-day Belgium called Flanders from 1384 until 1477 when it passed to the Hapsburg Dynasty. Eventually the Spanish took over the region in 1556. You can take this opportunity to address the formation of national borders in Europe—those contested but largely imaginary geographical lines. Scenes of contemporary life are also featured in Flemish paintings. The remarkable thing about paintings like the Mérode Altarpiece is that they set Biblical stories in contemporary homes and costumes. Streetscapes in the far background are sometimes more believable than religious scenes staged in the foreground. Describe the oddness of that imagery by asking the class to imagine staging the Annunciation scene in their house or apartment, with the Angel Gabriel wearing jeans and sneakers. This small, private piece also demonstrates the Northern love of symbolism. Every still-life object in the scene—from the white lily symbolizing Mary’s purity, to the tiny mousetrap at the bottom right symbolizing Christ as a snare for the devil—bears a religious meaning. You might take a moment to review the difference between an icon and symbol. Jan Van Eyck is the undisputed master of Flemish painting. His so-called Arnolfini Wedding Portrait is teeming with symbols (oranges, a convex mirror, one candle burning) and students can guess at their meanings. The furry little dog even symbolizes loyalty (think: “Fido” or fidelity). Again we have a scene of contemporary, middle-class domestic life in Northern Europe. As in the South, a new urban, merchant economy produced a middle class of art patrons in the North by the fifteenth century. See the activity at the end of this lesson for more on this painting. The portrait (and later the still life) developed as a secular type of painting in Flanders. Contemporary artist Nina Katchadourian plays with the look of Flemish portraits in her improvisational self-portraits taken in airplane lavatories. Jan Van Eyck’s Man in A Turban is presumed to be a self-portrait. The stunning color and textures (skin, stubble, cloth turban) of this painting were are achieved with oil paint. This medium was superior to tempera because it allowed artists to paint slowly, building up translucent, shimmering tones, whereas tempera dried quickly and was unforgiving. The comparison between these two media is laid out in this quick study guide. The minute depiction of the world that oil paints facilitated sometimes skewed toward the grotesque. Hieronymus Bosch’s altarpiece painting Last Judgment recalls Gothic scenes of hell, and was intended as a meditation on the folly of sin. It requires some time for the viewer to take in the all of the punishments and demons Bosch invented for his hell. You can find details here. You also might introduce the Renaissance altarpiece here and stress the drama of its opening and closing function. That grotesque and/or meticulous Northern vision crossed media. It wasn’t just oil paint that allowed an excess of symbolic detail. The Unicorn Tapestry, an artist’s drawing rendered in wool and silk by guild weavers, is a feat of textile weaving and religious symbolism. It hearkens back to the medieval bestiary but looks forward to Renaissance botanical studies. Printmaking flourished in the North with the arrival of printing technology in Europe, possibly from the East, where it had existed for centuries. Flemish painting styles are reflected in Martin Schongauer’s Temptation of St. Anthony. He achieves a sense of space and texture with engraving techniques like cross-hatching. Engraving onto metal plates for printing allowed artists to create fine lines without reverting to a negative image, as they had previously done when carving woodcuts. Albrecht Dürer’s Four Horsemen of the Apocalypse is a brilliant example of the woodcutting medium and a testament to the artist’s talent. Notice, however, that the lines are thicker than in engraved prints and that the hatching goes in one direction. The Museum of Modern Art’s fun tutorial What Is A Print? explains woodcut and acid etching, and you can learn about engraving here. If the fourteenth century had been a kind of awkward, groping adolescence for European art and identity (not to mention the Black Plague that killed a third of the European population), the fifteenth century saw more radical shifts toward a Renaissance (“rebirth”) of Classical thinking. For the medieval mind, faith triumphed over reason, but that paradigm would be reversed by the sixteenth century when artists recorded the world very literally as they saw it. In the North, the Classical legacy brought idealism, combined with Italian humanism and empiricism—close looking at the world. For example, the eponymous figures of Dürer’s Adam and Eve stand in contrapposto with perfected Classical anatomy (albeit in a German-looking forest with symbolic animals). Students can compare these figures “before the Fall” to Masaccio’s expelled pair. Dürer had brought home Italian elements from his visit to Rome, and his own thoughts on ideal human form are laid out in his Four Books on Human Proportion. Dürer’s Self-Portrait of 1500 portrays the artist frontally, Christ-like, and perhaps possessed of supernatural talent. He reasserts that identity by comparing himself to Melencolia I, the tortured intellectual archetype derived from ancient Greek medical texts about the four humors, or personality types. This brings up the same shift that took place in the Italian Renaissance, from artist as craftsman to artist as genius. Discuss with your class the role of an artist in today’s society with some of the following questions: What does a contemporary artist do for society? What about a designer? Should artists be paid or respected more than workers of other professions? What social class does an artist come from—then and now? Should an artist make more money than a master craftsman? Who pays/should pay for art? With the Protestant Reformation (think “protest and reform”), artists in the North including Dürer lost a major patron—the Church. The Protestant Church did not commission religious images, in part because one of the complaints against the Catholic Church had been its sale of indulgences (documents forgiving people of their sins) in exchange for sponsorship of Catholic artistic and architectural projects. Martin Luther began as a monk and professor of theology before challenging Catholicism. He was acquainted with the artist Lucas Cranach the Elder, whose studio painted a rather matter-of-fact likeness of Luther. He translated the Bible into German, so that lay people could read the text themselves. The Englishman John Wycliffe had translated it into the common language as well, for Protestant England. Rulers like Henry VIII, portrayed in Hans Holbein’s painting, tired of giving power to the Pope in Rome and thus had a political stake in the Reformation. So what did painting in the Protestant North look like? If you remove the angels and deities and overt religious symbolism from Flemish paintings, leaving only the little scenes of everyday life, then blow those up to the size of a landscape, you might get something that looks like Pieter Bruegel’s Return of the Hunters. Like Bosch, Bruegel composed a landscape brimming with interest, and expected a viewer to take time to look into it. This was a believable, but still idealized world where people worked hard but mostly got along. Bruegel’s Peasant Wedding exposed lower class life with charm and humor. You might point out how this type of scene set the stage for still-life painting. Once students are in the headspace of a fifteenth-century European, understanding the lack of power resulting from restricted access to knowledge, you may generate a discussion on the importance of literacy and universal education. Ask the class which technological revolutions have impacted society (as much as the printing press did) during their lifetime? Or the twentieth century? What shifts in thinking may revolutionize the way we live in the future? Can there be another kind of “Renaissance”? An easy assignment to engage students creatively might ask them to create an altarpiece from folded paper using their favorite movie or novel as subject matter. They should decide how best to compose the panels to tell the story sequentially. The exterior can be drawn in grayscale and the interior in full color for impact. It should be exciting and try to encapsulate a narrative in a few important scenes. Artworks are often surrounded by some degree of mystery. Art historians use all sorts of methods to reveal the history contained in them: science, archives, eye-witness accounts, etc. Read the Mystery of the Marriage transcript form the Open University and view the Smarthistory video on the Jan Van Eyck painting known as the Arnolfini Wedding Portrait. For example, it has been debated that this is a wedding portrait. As a detective you might have gone to the local church to check wedding records. As a scholar today you might look into marriage customs of the Flemish in the fifteenth century that you recognize in the painting. Your response should be given in a page or two of writing. Try to be creative!